Mary was born on 16 August 1893 in Dublin City to Robert and Sarah McDonald. Her father was a ‘Shop meter collector’ and her mother was a nurse. 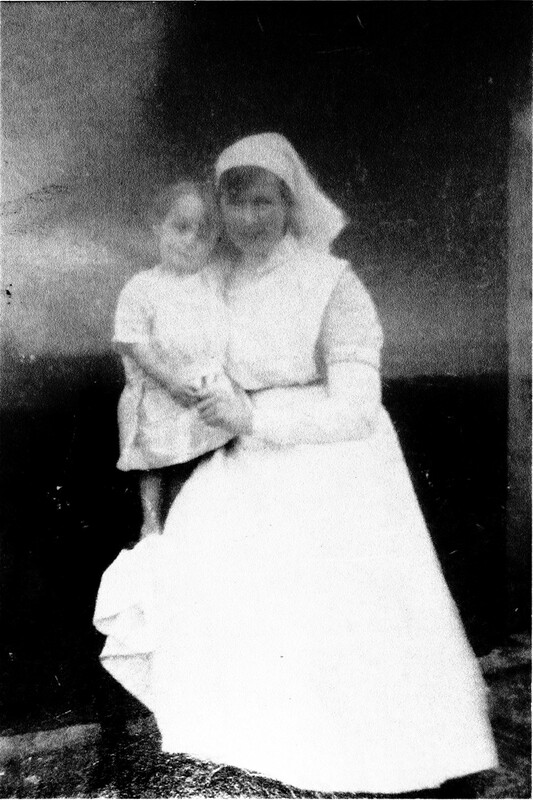 When Mary was only 1 year old the family moved to Abbeyleix where her mother became the first District Nurse in the area. At this time the District Nurse was based in the old Fever Hospital, this hospital was being run by the Vincentian Sisters, a French order, a fact that was to have a huge impact on Mary’s life. In 1913, at the age of 20, Mary moved to France to study teaching with the Vincentian Sisters but global events were to overtake her. The Great War broke out in July the following year and Mary’s life changed forever. She gave up her teaching studies and went to work in a military hospital in Alençon, Normandy. In 1915 Mary returned to Abbeyleix. 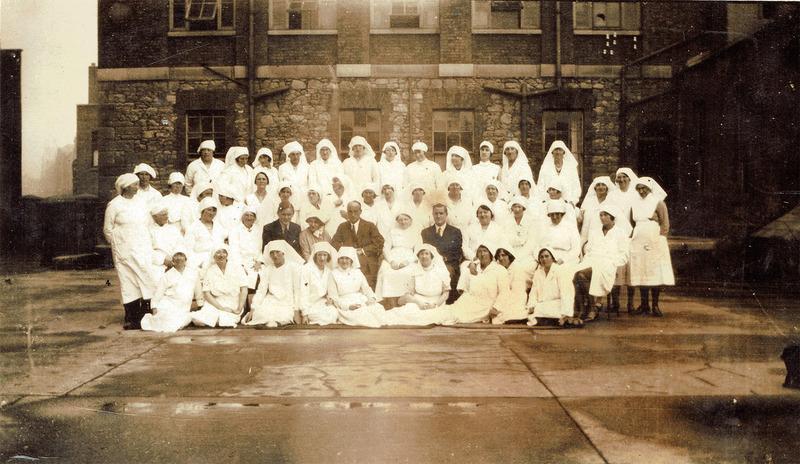 Early the following year she travelled to Dublin to begin the her nursing studies when she enrolled in the Rotunda Hospital to become a trainee midwife. Little did she realise that she was walking into what would soon become a war zone. She spent the week of the Easter Rising working in this hospital while soldiers were running through the buildings and bullets were bouncing off the walls and window frames. After Mary completed her Midwifery course she travelled to England to complete her General Nursing qualification in Providence Hospital, St. Helens, Lancashire before returning home once again, this time into the middle of the Civil War. 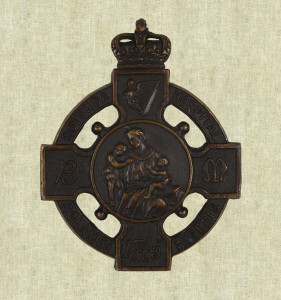 Mary married Edward O’Shea, himself a veteran of World War 1 who had been injured while serving on the Somme, in 1924 and 11 years later returned to Abbeyleix to take up the position her mother had once occupied, as District Nurse and Midwife. this job covered the entire district, from Ballinakill to Raheen and Shanahoe to Ballyroan, an area she covered on bicycle until she was forced to retire in 1950 following an automobile accident, in which she badly injured her neck, and a bicycle accident that followed soon afterwards. During these 25 years Mary delivered about 2,000 babies many of whom remember her with great fondness. Following her enforced retirement Mary turned her hand to writing and in 1966, to mark the 50th Anniversary of the Easter Rising, she wrote a memoir of the events she witnessed for the local branch of the ICA. In late 2014 we discovered a copy of this memoir in the centre and now to mark the centenary of the Rising we have produced a short film based on Mary’s memoir. This film has been created by John and Lucy of Kerbute Productions, the voice over was performed by Zita Hayes, music has been composed and performed by David and Mark Vesey, and has been aided greatly by Dr. Patch Thornton and Anne O’Byrne of the Rotunda Hospital, and Catherine Casey, Laois Heritage Officer. Funding was provided by Laois County Council through the the 1916 Community Grants. The film will be premièred on Friday, 19 February, 2016 at 4pm in Heritage House, Abbeyleix. All are welcome.